As I mentioned in my 2019 Collecting Goals posts, I have started down the path of trying to put together a 1957 Topps set. One could argue my time, energy and funds should be focused on my 1972 Topps set since that would complete my Topps run of sets from 1969 to present. However those dang high numbers but in price and quantity have made me give up in pursuing the set. Maybe if I run across a place to get some singles for a buck or two a piece or find a nice big lot at a reasonable price I will reconsider. But for now I am working on 1957 and find it much more fun (and surprisingly affordable). My goal for this year was to pick up 12 of the 30 cards with book values of $100 or more that I still needed. In the past when I start older set builds I tend to focus on getting lots of commons first then slowly acquiring the stars later on. I am hoping this approach prevents me from having a bunch of expensive cards left at the end. I have picked up some cards that fit the bill on COMC already but recently got my first $100+ card in my possession. 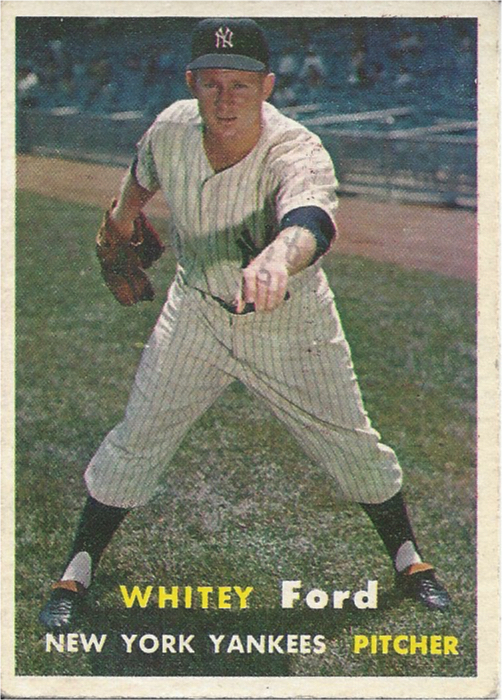 I was able to pick up this Whitey Ford card for $13.99 delivered. This card is in really nice shape with one exception that I am sure drove the price down. If you look at Ford's left arm you will some some pencil writing, I think it is the number 58. To my naked eye it isn't too noticeable unless you look really close and with the rest of the condition being so nice I was happy to add it to my set build. There is a nice write up and shares the start of his amazing career World Series record. Ford put up some pretty amazing stats. I know that wins and winning percentage are not as important to most as they used to be but winning over 74% of his decisions through his first 5 years is pretty impressive. I love the cartoon on the back. Interestingly, I did a google search to see if the 45 hits in a game had been broken. I found some inaccurate information on line but was able to track down a game from 1922 with 51 combined hits - August 25, 1922 Phillies vs. Cubs and an extra innings game from 1932 with 58 combined hits - July 10, 1932 Indians vs. Athletics. 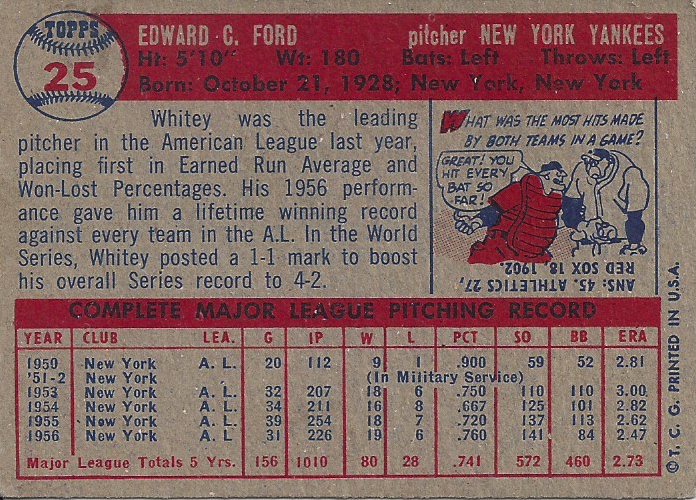 Both of those were prior to the printing of the card so I am guess recording keeping wasn't quite as easy as it is today with baseballreference.com. My last thought when looking at this card is surrounding the nickname Whitey. I am not super political but have seen some recent news stories about politicians dressing up in black face back in the 80s and know that there is a decent amount of racial tension in some parts of the country and quite a bit of political correctness in today's speech. I am guessing the days of a blond dude named Ed being nicknamed Whitey are probably over. Wish me luck on tracking down some other good deals on 1957 Topps cards! Awesome card! I've been on the lookout for a nice Ford for my collection. I'm considering either this card or his 60T card. Best of luck on your hunt for good deals for your 57T set.